Today, the 4th ODI cricket game will be played between South Africa and the West Indies. I have supported the West Indies for many years and it is tough job! Last week, the South African team were truly impressive with AB de Villiers scoring his fantastic 149 from 44 balls. It is an innings that will be remembered by everyone who saw it. 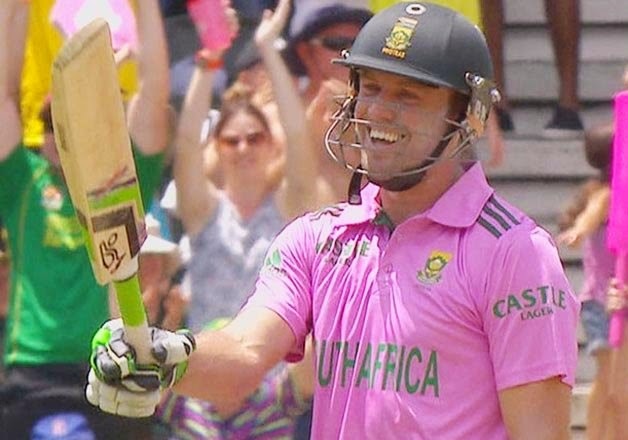 AB was dressed in pink for his impressive knock and many people will know he was dressed in pink as a visual prompt of the funds being raised for Pink Drive. The cricket match was sponsored by many corporates including SAB Miller, Bidvest and Momentum. Well done and thank you to the sponsors and to the Proteas. The Breast Course for Nurses is very grateful to it's corporate sponsors and is privileged to have individual sponsorship as well. In 90 days time, Jessica Knight and her sister, Julia, will be cycling as the Santa Sisters from Heidelburg (Gauteng) to Scottburgh (KwaZuluNatal) in the joberg2c mountain bike race. 900 kms of off road cycling! They will be raising funds for the Breast course for Nurses and we will be following their preparation on this blog, the web page and on facebook page. It is a wonderful way to start 2015. Jessica and Julia will also be raising funds for Breakthrough Breast Cancer, a UK organisation who raise funds for breast cancer research. There is a symmetry about having chosen an innovative research based organisation and a grass roots clinical NPO. We are really looking forward to following their progress. Please watch out for details.